Sanada Masayuki built Ueda Castle in 1583. In 1585 and 1600 he turned back two attacks by Tokugawa Ieyasu. 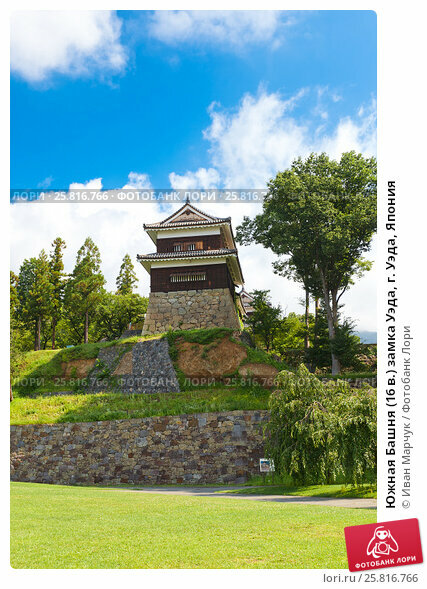 Before the Battle of Sekigahara in 1600, Sanada met the forces of Tokugawa Hidetada at Ueda Castle. He repelled the 38,000 warriors of the Tokugawa with only 2500 castle defenders. The castle town was very well planned and the castle deftly made use of the rivers and landscape for its defense. This battle sufficiently delayed Hidetada so that he didn't arrive in time for the battle of Sekigahara. After the Battle of Sekigahara, Ueda Castle was given over to Sanada Nobuyuki who was ordered to destroy it by the Tokugawa. He razed the castle and moved to Matsushiro Castle. Sengoku Tadamasa started rebuilding Ueda Castle in 1622. He redug the moat and started restoring the Honmaru and Ninomaru before he died. His work was not continued after his death, but the structures you see today date to this time period. Входит в серии автора Фортификации (замки, кремли, крепости) и Япония а также в 5 альбомов.